Republican billionaire Michael Bloomberg has been elected mayor of New York in the most expensive mayoral contest in US history. He will replace the hugely popular incumbent, Rudolph Giuliani, next January. The Democratic candidate, Mark Green, conceded at the end of a closely fought battle. Mr Bloomberg, 59, beat his rival by a margin of around 40,000 votes, polling 711,189 to Mr Green's 670,413. "New York is alive and well and open for business," Mr Bloomberg declared in his victory speech. A month ago Mr Bloomberg was trailing far behind in the polls in spite of having spent more than $50m of his personal fortune on his campaign. But he received a boost when he was endorsed by out-going Republican mayor Mr Giuliani. Mr Giuliani's solid performance after last September's attacks on the World Trade Center sent his popularity soaring. But he could not seek re-election as he had already served two terms. During the campaign Michael Bloomberg and Mark Green took similar stances on several issues. Both said they intended to rebuild lower Manhattan and bolster New York's economy after the terrorist attacks. They also agreed on continuing Mr Giuliani's campaign to make New York a safer city. The contenders traded insults during the campaign but were conciliatory once the result was known. Mr Bloomberg described the election as a "tough and close race". He said Mr Green had been gracious in defeat and deserved the respect of the people of New York. Mr Green called on New Yorkers to support the new mayor. "Over the years Mr Bloomberg has given so much philanthropically to so many good causes, and now he has to bring that spirit of generosity to his greatest challenge, helping rebuild and recover our city," Mr Green said. BBC's Gavin Hewitt: "This has been a tough, sometimes mean-spirited campaign"
Michael Bloomberg founded the financial news and information services company Bloomberg LP. The company has an annual turnover of approximately $2.4bn. 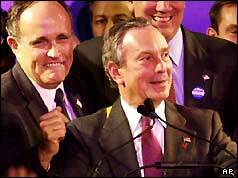 For many years Mr Bloomberg was a Democrat but he became a Republican in 2000. His win was initially welcomed by the press but shortly after he took office in January 2002 his popularity was slipping and he was compared unfavourably with his predecessor. He has raised taxes and cut costs and he has also won himself a reputation as a killjoy - smoking has been banned in bars and clubs. A crusade was also launched by Mr Bloomberg against street vendors. But for all the criticism, a poll in 2004 on Mr Bloomberg suggested that while he may not enjoy adulation, his approval ratings are up - some 50% of New Yorkers believe he is doing a good job. He is running for re-election in November 2005.